We all have them; those little painted and glittered rocks, that letter written by a 5-year old that told you why you are the ‘best mom' and those grade school art projects that *you believe* are fit for any museum (heck…I have several of the latter professionally framed in my home!). These Pet Masquerade Party portraits fall in to that category for me. 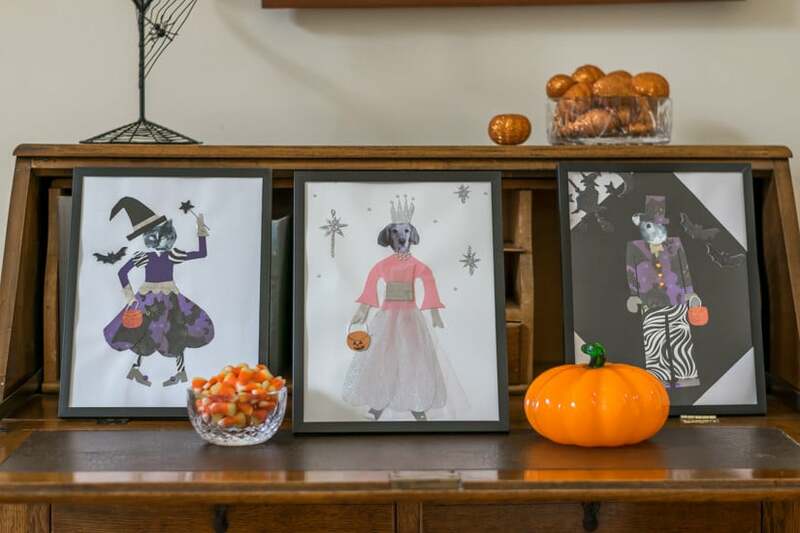 If you are looking for an Easy Halloween Craft, it's the perfect one. We started this Pet Masquerade Party several years ago and have made additions over the years as our menagerie has grown or shrunk. But first…as usual…the backstory of my Pet Masquerade Party, which is such an easy Halloween craft. When my kiddos were younger, Halloween was a BIG DEAL in our home, maybe not quite on the scale of Christmas in terms of decorations, but ‘pert dang close.' Since our house was decorated to the nines, it just made sense for us to have a party on Halloween night. Our home would be filled with costume-clad friends and family for food and festivities, followed by en masse trick or treating around the neighborhood. Once my babies became too old for trick-or-treating, we fell out of the party routine as well. However, it is still fun to decorate, though on a slightly smaller scale. 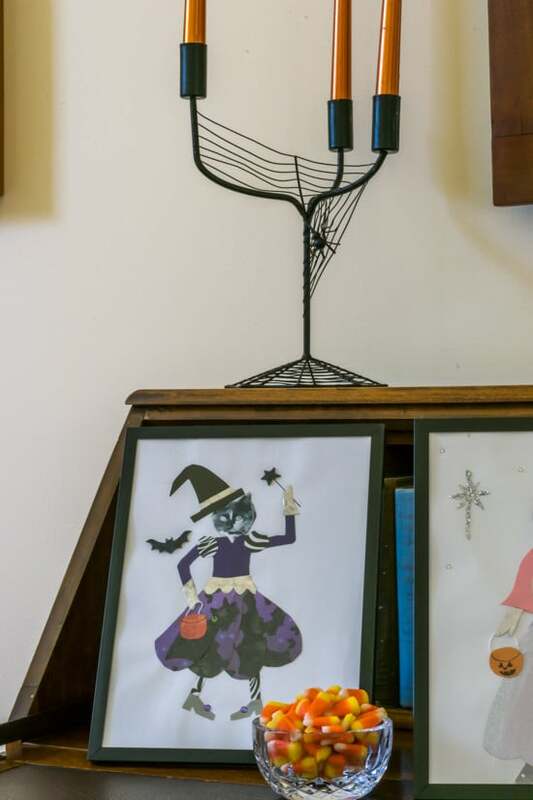 When I went through my attic last year as part of my de-cluttering, I sorted through and passed down many of our large and ‘child-focused' decorations to a family friend with young children, hoping that the decorations would liven their Halloweens. However, despite my wholesale declutter mode, I held on to some of my favorite decorations, especially those that we made or have sentimental value. These Pet Masquerade Party pictures fall in to both categories…the kids and I made them and they hold a very sentimental place in our hearts. This is such an easy Halloween Craft project and suitable for kids and adults…I have just as much fun putting these outfits together as my kids do. The supply list is pretty short and creativity is key for this project. Heck, I could even see making this into a Grown-up Girl's Craft Night project. Anyone local game? I was able to find everything I needed at my local Michael's, but you can also find the stuff on Amazon. Black and White Photo. We used photos of our pets, but there's no reason you couldn't use photos of your favorite 2-legged pets as well. A variety of Halloween Scrapbook paper. White and Black Cardstock. I used 8″ X 10″, but that's so up to you. We also attached some bat stickers . Patterns…this is so up to you, but if you would like patterns to use, I've included them in my subscriber library. This library is made available to all subscribers immediately upon joining the Nourish and Nestle family. (You can sign up in the tan box to the right, or by clicking the ‘Subscribership Has Its Benefits' link towards the end of the post or by clicking here. Use your printer to shrink down the face of your sweet pet. The patterns give you a guide to follow for the size of the head, relative to the pattern pieces. You can cut that circle out and place the hole over your pet's head to see if it fits inside. Cut out your pet's face. I kept in the ears and a little bit of the neck. Cut out the clothing. If you are making your own patterns, then it'll be a little ‘trial and error' to get the proportions right…just a little snip at a time. Glue it all on and add some bling. Put it in a frame so that you can pull it out year after year and it's still in good condition. Since Kate's hamster, Scoobi Doo, was one of our party-goers, that means that we did that one 5 or 6 years ago and it's still in perfect condition. Presto Magico…you have your Pet Masquerade Party-goer. First up, we have ‘Puddles the Bad Witch'. There was really no choice but to make Puddles a witch…she is really an ornery and often times downright nasty cat. Her name reflects exactly where we found her when she was 2 weeks old, after a Hurricane blew through our town. We bottle fed her and taught her to use the litter box, and I think somewhere in her soul, she really does love us…kinda..sorta….at dinnertime. But I have to say, there is just ‘something' about Puddles. She's smart as a whip, full of character and has easily (and in dramatic fashion) used up every one of her 9 lives. Then we have ‘Brandy the Sweet'. Brandy left us 6 years ago, but we talk of her fondly and regularly. She loved more than anything to be in the car when we drove through a water puddle! She was a great pup for both my babies and suffered through many dress-up parties…in real life. ‘Scoobi-Doo…the Hamster' is next in line. Scoobi-Doo was the final hamster in a string of hamsters much loved by Kate. We had our fair share of ‘interesting' hamsters, but I do believe that Scoobi-Doo ended up being Kate's favorite. And doesn't he look dapper! And finally, we have ‘Flora, the Practically Perfect in every way Princess'. If you've been a reader for any length of time you know that this family is quite smitten with this girl. It always make me smile to have our coterie of beloved pets play a part in our annual Halloween decorations. And, as much as it pains me to say it, I have to say that Puddles' ensemble is really my favorite. Well, there you have it my friends, an easy Halloween craft, which would be fun for all ages. And as important, one that you will enjoy pulling out of your Halloween decorations box every year. And if this little craft weren't enough of a Halloween ‘treat' today, I've brought 7 of my buddies to share their Halloween decorating ideas. If you click on the images below, you will be taken to each of their sites. I don’t know how you came up with this idea, but it is fabulous! How cute! I need to make one for our new Puppy! Thanks so much for the inspiration, I am pinning this to my Fall Decor board! Oh you do need to make one for that adorable little guy! You could do one while he’s a puppy and when he grows up next year too. Have a wonderful weekend my friend. I adore this project so much and just love the way you created the cute costumes to match their personalities. What a fun way to honor the four legged members of our family. From one golden retriever lover to another…we know the golden retriever had to be the good witch. 🙂 And the stories about Puddles…totally made me laugh out loud. Full of personality they are. Thanks Tammy…and you are right…Flora is so the good witch. Yeah, and I just touched on the PUddles stories…we are full of them. I have been told many times that I should write a book about her and her antics. Thanks for visiting today my friend. These are darling Lynn! I love happy fun projects and this one is definitely one to pin! Thanks Joy…they are so fun to make and to bring out each year. They make all of us smile and reminisce about the process of creating them. Wishing you a wonderful weekend. This is awesome!! Halloween has always been a favorite time of year for me. I think it’s because my birthday is two days before Halloween and I always had a Halloween themed party. Great job on your craft! Oh, you have a birthday coming up!!! I can imagine that Halloween was always fun for you and seems like you continue to carry that fun on today. Thanks for swinging by to visit today my friend. Scooby Doo is my favorite! I love that you included the hamster in your pet round up. These are absolutely precious and a great way to include your pet in your Halloween fun! Awww…Kate will be so happy to hear that. Have you avoided the hamster trap thus far? It was hard for me to deny since I had hamsters, guinea pigs, bunnies, cats, dogs and a horse growing up. All things considered, I got off pretty easy with just the hamsters, cats and dogs! Lynn, we actually have no pets!!! I’m a pet lover (I grew up with an identical list to yours), but my husband never had one growing up and has been really hard to break. The kids and I are slowly breaking him down though, and I’m pretty sure we will eventually win this one. Keep at it girlfriend…there’s no doubt you’ll ultimately win. I mean after all, don’t we usually win? ? Thanks Debra, I do love bringing them out year after year and adding to them as necessary. It’s become ‘our’ thing I guess. Does it make us a tad odd that we enjoy making paper dolls out of our pets? Possibly. But thanks for swinging by today. Aww, this is such a fun Halloween Craft Lynn! I can totally see the girls and myself making these, using our two naughty bunnys headshots to dress up! Flora does look amazing, I really want to snuggle that dog one day for real and I will bring my girls along, they’d never want to leave, lol! I didn’t know you had a dog before her, aww, how nice that you have this fun craft of her. And that witchy witch, lol, seems like she’s up to no good! Wishing you a fun month of Halloween preparations!! Hi there girlfriend! This might be too much for your kindergarteners? In any event, those darling bunnies will make perfect models for whatever outfits you and your girls chose for them. And Flora would love for you to snuggle with her…anytime, anyplace and preferably for a very long time. Do you guys celebrate Halloween over there? What a cute idea! My kids would get a kick out of this-? Thanks Sarah…it’s a great craft to do with young and old kids. My daughter enjoyed it in middle school and now in College. It’s just fun and relaxing. Lynn, These are the cutest!!! I’ve got to make some for ours, past and living puppies. Seriously, so adorable! I can see these lined up on our mantel for next year and you get all the credit! Aww Carol, thanks for the love. There is no doubt in my mind that your portraits will take this to a whole new level. I can’t wait to see. How cute is this Lynn. I love what you have done here. It is a perfect way to pay homage to your pets and have fun at the same time. Thanks Mary…the whole fam loves them and giggles over the personalities. Thanks Kim…They are a family favorite for sure! Thanks for swinging by today. That is the cutest Halloween project! I so wish my kiddos were still young! Children can be so creative.